Flickering images on screen conjure inner and outer landscapes. FLL courses teach students how to read world cinema, from classics to new experiments in international cinema. 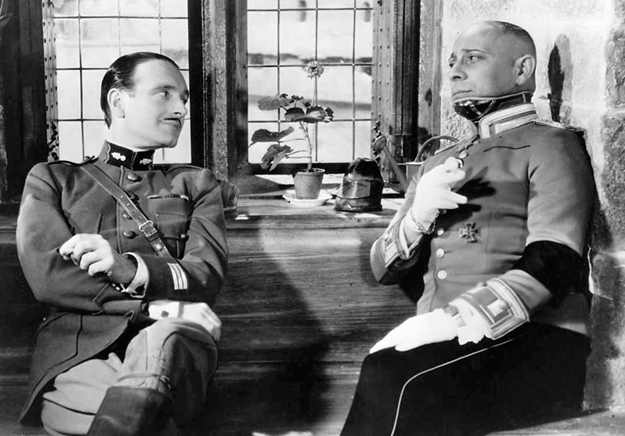 Above, an aristocratic French and German officer converse about World War I in Jean Renoir’s The Grand Illusion (1937). The course objective is to explore and enjoy the representation of ancient Rome in contemporary popular culture through some famous cinematic representations of the Eternal City. The myth of Rome – Republic, Empire, city of passion and decadence – is constantly reinvented to promote new film technologies and to suit the different historical contexts for the interpretation of the ancient Roman past in the present day. In this course we view a selection of American and British films made during the years 1950 to 2000, and study how these movies show a variety of strategies in their narratives of Roman history; how they make different connections between the Roman past and the present moment of cinematic reconstruction; and how they offer diverse aesthetic pleasures as they recreate the myth of Rome for their audiences. Big screen projections of Rome allow us to examine the ways movies intersect with the national, political and cultural identities of the places/times in which they were produced, and also allow us to understand how films actually redefine those identities with their own visual, artistic, and cinematic styles. Films viewed include Mervyn LeRoy’s Quo Vadis (1951); William Wyler’s Ben-Hur (1959); Stanley Kubrick’s Spartacus (1960); Richard Lester’s A Funny Thing Happened on the Way to the Forum (1966); Terry Jones’ Life of Brian (1979); Mel Brooks’ History of the World, Part I (1981); and Ridley Scott’s Gladiator (2000), among several others. The course objective is to explore the influence of the classical tradition, with a focus on the origins and flowering of ancient Greek culture and literature. The main emphasis is on Greek culture as it manifests itself in primary literary sources, in particular the Greek epics, the Iliad and the Odyssey of Homer. This course is designed to give students a familiarity with Greek literary and generic themes by using a contemporary cinematic approach of interpretation. The literary and cultural themes explored in this course are illustrated by the viewing of a selection of recent American films, and student work in this course investigates the influence of Greek literary themes and tropes on modern cinematic production. The course builds on student reading of the Homeric poems by exploring how epic themes and images have been used in modern popular culture entertainment in several recent films: Wolfgang Petersen’s Troy (2004), Clint Eastwood’s Unforgiven (1992); Ridley Scott’s Blade Runner (1982); Andrei Konchalovsky’s Odyssey miniseries (1997); the Coen brothers’ O Brother, Where Art Thou? (2000); and George Miller’s Mad Max: Fury Road (2015). Students consider how the films “adapt” the epic poems, either by attempting to tell the same story in the same context (Troy, Odyssey) or by using the tropes and plots of the epics in a different setting or environment (Blade Runner, Unforgiven, O Brother, Fury Road). This course investigates “French film noir,” an oxymoronic expression as the term “film noir” was coined by French critic Nino Frank specifically to address new American hard-boiled crime films coming out of Hollywood. Nevertheless, beginning in the 1950s, there is a distinctly noir trend in French movies, that continued well into the 1960s. The course therefore explores diachronically the emergence of a specifically French incarnation of this genre while bearing in mind the contradictions that speaking of French noir might entail. Having noted this tension, there are numerous overlapping preoccupations in American and French iterations: the evolving attitudes towards commodity cultures; the changing role of women; the place and role of the foreigner; violence; the city; and movement. What is unique to French noir is a specificity evident in language, social relations, regionalisms, etc. Just as important are the critical historical events that marked France in the Twentieth century: WWI and WWII; the apogee and fall of the French colonial empire, the movement from an agrarian economy to industrialization. These will be the backdrop for many of the films covered in this course and will define much of what makes them French—and what makes them noir. This course offers a study of French cinema from the 1990s up to the present. We will consider the major cinematic genres that have emerged during this period: le polar, le cinéma du look, le cinéma de banlieue, and le cinéma beur. We will look at themes such as sexuality, gender representation and equality, education, migration, the crisis of urban violence, forms of social marginalization, and questions of political justice. Along the way, we will also think about the civic and republican ideals that unite and separate France and America. Readings and discussions will be in English, and in-class film screenings will be in French with English subtitles. There was a wall. It did not look important. … Where it crossed the roadway, instead of having a gate it degenerated into mere geometry, a line, and idea of boundary. But the idea was real. It was important. Like all walls it was ambiguous, two-faced. What was inside it and what was outside it, depended upon which side of it you were on. This course will focus on filmic (and two literary) representations of the divided Germany (1949-1990). We will look at films that document the division of Germany, and that fictionalize border crossings between East and West Germany. Although most films that we will watch were produced in West Germany, we will also analyze four East German films to discuss how they attempt to construct a specific image of and identity for the GDR. The focus of our discussion will be the concepts of the nation, identity, and specifically national identity as it is constructed in these films. The course explores 19th-century Russia (‘The Golden Age’) through film, focusing particularly on films and written works that have addressed Russian history, culture, and society. We will discuss how these art forms reveal and construct the relationships between nobility and serfs, the social and political agendas of Russian intelligentsia, the emergence of the ‘Russian idea’, the attitudes and relationships with the West, the autocratic power of the tsars, and much more. The films chosen for this course are all based on famous Russian classical works by Pushkin, Tolstoy, Gogol, Dostoevsky, Chekhov, and others. Since 2012, China has become the world’s second largest film market. This still expanding market can be characterized in the following aspects: an influx of enthusiastic middle class viewers, a fast growing of the number of silver screens, and an intensification of transnational film production. The movie industry produces all sorts of genre films, such as melodrama and film noir, fantasy and sci-fi, documentary and costume films. This course, however, focuses on the representative auteur films in order to pursue a comprehensive and critical understanding of China. These auteur films on one hand are configured in a sophisticated temporal-spatial construction, and on the other represent and visualize the social, economic, cultural and historical phenomena and problems. The works are selected from filmmakers of the Fifth Generation of China (such as Zhang Yimou, Chen Kaige, and Tian Zhuangzhuang), Hong Kong Second Wave (such as Fruit Chan and Wong Kar-wai), and Taiwanese New Wave (such as Hou Hsiao Hsien and the late Edward Yang). The themes of discussion include identity and community, memories and trauma, revolution and nostalgia, etc. GERMAN CINEMA: How German Can It Be? This course will present a synoptic view of German cinema from its inception to contemporary manifestations. Special emphasis will be placed on Weimar Cinema, the New German Cinema of the ‘70s, and German cinema after unification. The concept of the nation and national cinema will be the central terms in the examination of key discourses with respect to German Cinema, such as: the Autorenfilm (authors’ cinema), the transformation of the public sphere, and the shifting emphasis from film as cultural artifact to film as cultural commodity during the 1990s. Readings and discussions will also focus on the complex interrelationship between film, history, and society. In addition, we will explore the relationship of German Cinema to Hollywood and other national cinemas, such as the French Nouvelle Vague. The Cinema is an invention without a future. More than a century ago, on December 28, 1895, the Lumière brothers held the first public screening of motion pictures in a Paris Café. Shortly after, first attempts were made to conceptualize the unique traits of an art that critics today frequently refer to as the art form of the 20th century. This course seeks to introduce students on the graduate level to major issues and debates in film theory of the past eighty years. The first part of the course will provide a structural framework for the analysis of visual narratives, and address questions of technique, narrativity, diegesis, and cinematic coding. We will then proceed to examine major developments in classical film theory, such as the relationship between the real and the image, and the evolution of a cinematic language. The major part of the course, however, will investigate post-classical theories of film that often focus on cinema as an ideological apparatus that produces a distinct subject effect. These approaches are informed by Althusserian marxism, Lacanian psychoanalysis, post-structuralism, semiotics, and feminist theory. The term “Intercultural Cinema” seeks to accommodate everything that terms, such as Third Cinema, Fourth Cinema, hybrid, migrant, marginal, postcolonial, marginal, and interstitial cinema suggest, and pretends to be less “loaded” in the words of Laura Marks who coined the term in her seminal work Skin of the Film: Intercultural Cinema, Embodiment, and the Senses. The term responds to the crisis of the modern nation-state and emphasizes culture instead. Modern nations are no longer, and actually have never been, manifestations of singular cultures. Exchanges between cultures determine the reality of nations and are far from equivalent and neutral as the term may suggest. In this class, we will look at a number of films that focus on these exchanges. We will investigate how these films attempt to offer different perspectives, readings, and representational strategies in response to dominant cultural configurations. This course offers a survey of French and Italian cinema from 1930 to 1970. We will consider films in light of the historical and political events that shape twentieth-century France and Italy, such as the First and Second World Wars, workers’ struggles, the rise of fascism, the Occupation, the Algerian War of Independence, and the Revolution of May 68. Readings comprise key texts by filmmakers, critics, and theoreticians of cinema. Directors include, but are not limited to: Frederico Fellini, Jean Renoir, Vittorio de Sica, Roberto Rossellini, Alain Resnais, Robert Bresson, Chris Marker, Jean-Luc Godard, Michelangelo Antonioni, Pier Pasolini, and Bernardo Bertolucci. The course does not presuppose any knowledge of French or Italian cinema. Films will be screened in the original French and Italian with English subtitles.